It also has pictures of “Romanised” local shops, of which the one of the Job Centre labelled “Forum Venalicium” – “slave market” – seems to be the most popular. 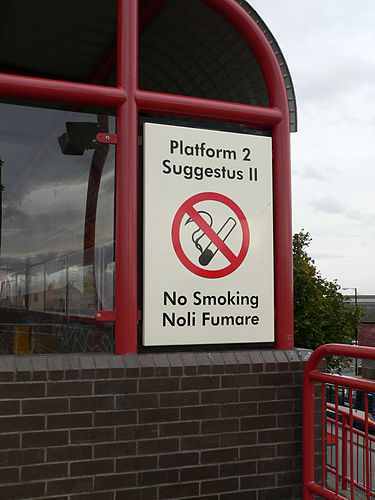 Author Anna P. JudsonPosted on July 16, 2013 Categories Random thoughts, Weird and WonderfulTags Latin, metro, Newcastle-upon-Tyne, Wallsend metro station9 Comments on Caecilius est in metro? The vast majority of recent ‘Classical’ movies are, almost universally, completely mangled versions of the Classical history/mythology/literature on which they were supposedly based, without even the potentially redeeming feature of decent acting (I’m thinking of ‘Troy‘, ‘300‘, ‘Centurion‘…I’m sure you can fill in others). Classical movies from several decades ago, on the other hand, are, almost universally, completely mangled versions of the Classical history/mythology/literature on which they were supposedly based, without even the potentially redeeming feature of decent acting…and yet possessed of a certain vintage charm that somehow makes them utterly hilarious and hugely entertaining to watch. In our never-ending quest to bring our readers the best in home entertainment, therefore, Res Gerendae‘s dedicated team of film critics selflessly set out to investigate and judge a series of cult Classics films – broadly defined as films relating (or claiming to relate) in some way to Greek or Roman history or mythology, dating from the 1950s-1980s. Ladies and gentlemen, without further ado, I give you – the Cult Classics Oscars! It's All Greek To Me Create a free website or blog at WordPress.com.